Deep Thoughts from an Author's Cave: Author Hangout - How to Find Your Readers! Having a hard time finding potential readers for your book? So, as an author, there are some great things about being in the year 2014 like-and this one causes me nightmares-what if I had to type my books on an old typewriter-non-electric, no backspace and no delete key? Ahh, it's a wonder anyone ever published anything. 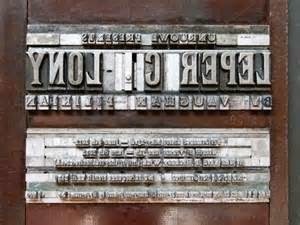 Of course, think of the poor sap that had to line up the letters on the old letterpress! However, today you simply do not have the luxury to write and only write...oh no, you must spend equal or more time marketing your grand masterpiece once it is complete. With social media, there are more ways to market than you can imagine...and how do you use them in the most efficient way to get the best bang for your buck, or in this case your time? Well, sorry folks, I do not have all the answers for you, but I did attend this Book Marketing Tools-Author Hangout event today "How to Find Your Readers" featuring a top selling author, Cristin Harber, who is self-published and has figured out a way to sell 10,000 copies per month. Fine, if you are already there...selling 10,000 copies per month, then why are you here? GO WRITE! If you are not, I highly recommend you check out the recording. If I have your attention, please click on the link below to do so. 1. Continually feed the Beast - the "Beast" being Amazon. Content, content, content people. You cannot be Margaret Mitchell anymore and sell one novel or you will be "Gone with the Wind". 2. When using Twitter, or any social media for that matter, do not simply blast your book hundreds and thousands of times. Instead, get into conversations with people. Cristin said every time she tweets "non-bylink" tweets, she gains followers...and they eventually find her bylinks. Make yourself interesting!. Do you want to hear about someone else's book 24/7? No, probably not. If you do, your weird, but we'll still like you anyway. 3. Cross promotion - Cristin's word to describe this tool was HUGE. Have a group of fellow authors and cross promote each others' works. If you don't have any friends, we welcome you to join our Book Review Depot community here. Book Review Depot Google+ Community, or for you resisters still over on Facebook (we'll talk about that later) you may join us here. Book Review Depot FB. So, that is all I am going to tell you, but if you are trying to figure out some new methods for marketing your book and finding your readers, do yourself a favor and check it out! p.s. If you enjoyed this post, please click the +1 button just below here so that other people might be able to enjoy it, too! Thanks Ginger... What a wonderful advocate for the Indie authors! You give so much of your time helping us to become successful... You rock! Thanks for the love Rene! This was a fantastic interview and now I have some new things to try! Hi! I keep trying new things all the time too. This is a great blog, and thank you for sharing. Thank you! I really enjoyed the interview yesterday and look forward to trying some of your ideas! Congrats on fantastic sales!